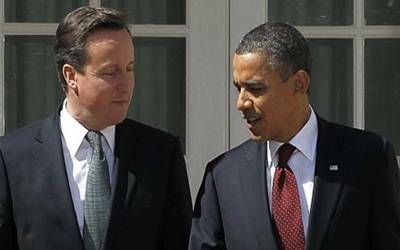 Washington, Dec 5 (IANS) US President Barack Obama discussed with British Prime Minister David Cameron, the fight against the Islamic State (IS) group, the White House has said. Obama on Friday "welcomed the outcome of the vote and expressed his appreciation" that the UK has joined the counter-IS campaign in Syria, Xinhua quoted the White House as saying. Britain’s house of commons on Wednesday voted to support a government motion on extending British airstrikes against IS in Syria. "The leaders discussed further steps that can be taken to degrade and destroy IS," said the White House. They noted that all countries were welcome to join the existing fighting-IS coalition, "if their political and military objectives in Syria were consistent with those of the coalition", it added. Cameron also extended condolences over the loss of life in Wednesday’s San Bernardino shootings in California, the White House said.